If you’ve visited this site before, or if you’ve seen a performance of my solo show, Piecework: When We Were French, you no doubt know that the play was based on a series of interviews I conducted with Franco-Americans. The interview process was in no way exhaustive. It was meant to give me a sense of the themes, ideas, and memories common to most people of French-Canadian ancestry. In the end, there were only two ideas that came up in every interview. First, every person referred me to someone else who they felt was “really French.” Perhaps this other person spoke French, or perhaps their family had immigrated more recently. Perhaps they maintained closer ties to Canadian relatives, had a greater interest in genealogy, or just seemed, in my interviewee’s estimation, somehow more authentically French than themselves. This other person was the person I should really interview, the current interview subject would tell me, because they were, after all, “really French.” This fascinated me, as I recognized the same tendency in myself (I perceived all of my interviewees to be more authentically Franco-American than I was), and I began to see this sense of not-French-enough-ness as a defining feature of Franco-American identity. The second and only other thing that came up in every interview was…wait for it…meat pie. Yes, maybe the Franco-Americans I spoke with no longer spoke French; some of them may have had an ambivalent relationship with the Catholic Church; and perhaps they couldn’t pick their Canadian cousins out of a line-up, but each and every one of them still has tourtière at Christmastime, just like mom or mémé or matante whoever used to make. 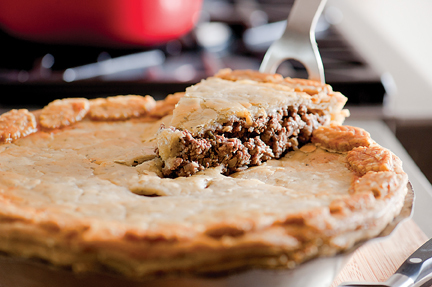 It turns out there’s vast disagreement over how to make a proper tourtière in Quebec, too. This archived CBC radio program attempts to narrow down the recipe — and it captures some of the passionate opinions that can emerge when you get people talking about tourtière. One cherished recipe can connect you to your heritage. That’s what Piecework: When We Were French is all about: the bits and pieces we make our histories out of. Remember to visit our Indiegogo fundraising page to learn about the Piecework DVD and how you can support its production! This is very interesting. It is striking how disparate, in some ways, the French Canadian communities of the Great Lakes and New England are so different. Of course we have common origins and lots of common ancestors, but in terms of culture they are quite different. It’s due obviously in part to when the communities were formed, but I wonder if it is also due simply to the longer-term separation between Quebec and the F/C communities further west. There are commonalities as well: targeted by the Klan in Michigan in the 20s, working class, Catholic. But the differences are there as well and I wonder if others see that as well. Thank you for your perspective, James. I going to read up a bit more on French-Canadians in your region and see if I can put together a half-way intelligent post on the topic at some point.